40 Years of Woodstock – The Legend Is Still Alive! Mid-August 2009 marks the 40th anniversary of one of the most important events in more recent music history: the Woodstock festival. An event which not only changed the music scene in a profound way but also left a deep imprint on society as a whole. We have taken on this subject and written the musical 'In a Summer of Love', a thrilling piece which makes use of the music of the late 1960s to recreate the era's attitude to life. 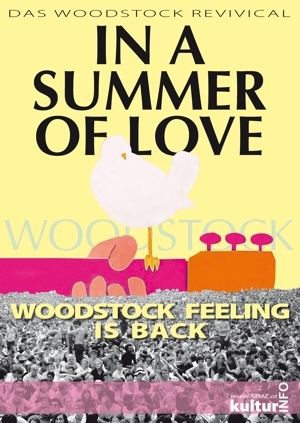 Journalist Bob is once again tasked with filling the summer gap and, as a 'contemporary witness', asked to write a series of articles on Woodstock. To this end, the highly individualistic loner's chief editor pairs him up with Nancy, an ambitious rookie journalist. Nancy, anything but enthusiastic about the task, would much rather prefer to work in the paper's lifestyle section. Eva, an Austrian, spent one year as an exchange student in the US from September 1968 till August 1969. Having enjoyed a sheltered childhood, she stayed in San Francisco with a family which was deeply active in the hippie movement. In the present, she works as a teacher for English and history and is currently exploring the subject of Woodstock together with her students in a trans-disciplinary project. Dealing with the young students, who did not experience the era and view it from a distance with a rather cool attitude, Bob and Eva relive the spirit of the time. They are confronted with the issue of what is left of their ideals and ideas. And they go on a trip to where it all began: the festival site of Woodstock. 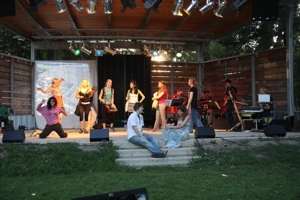 The story is told by incorporating the era's music and features a large number of hits of the 60s.